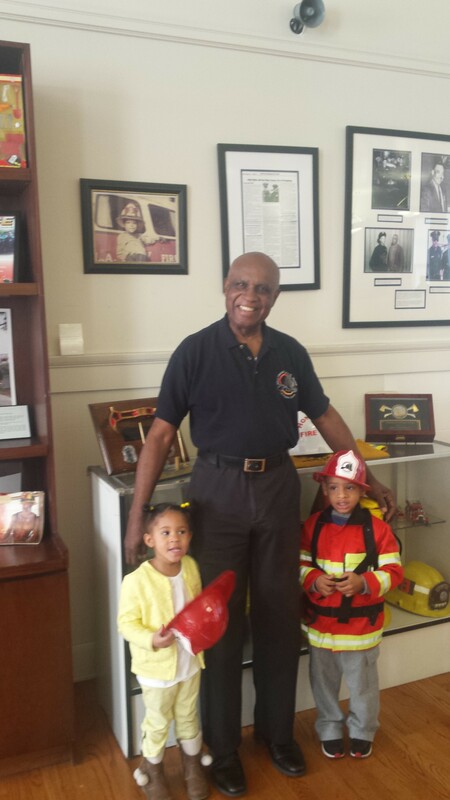 The African-American Firefighter Museum officially opened in 1997, and I first heard of it in 2015. I am a Los Angeles native attentive to African-American cultural events and venues, so I was surprised by my own ignorance. The museum has limited hours, so I was glad when I could arrange my schedule to visit after Christmas. I called to make sure the museum would be open and reached Jimmy , who was there to greet me when I arrived. He had just given a tour to a group of children from the Pasadena YMCA who enthusiastically donned their plastic fire helmets as they ate their lunches in the courtyard. Jimmy explained to me that he was not a retired firefighter. Instead, he had been the fire safety director for Northrop Grumman, and when he took a tour of the museum a few years ago soon after his retirement, and he got inspired to volunteer. A three and four-year-old sister and brother duo joined our tour along with their baby cousin, auntie and grandmother. The four-year-old boy took the family field trip very seriously, for he was decked out in his Fire Chief jacket along with a water tank for his back and his very own helmet. When Jimmy offered the news that if he started as a firefighter today, he would earn over $100,000 per year, Grandma nearly jumped for joy. 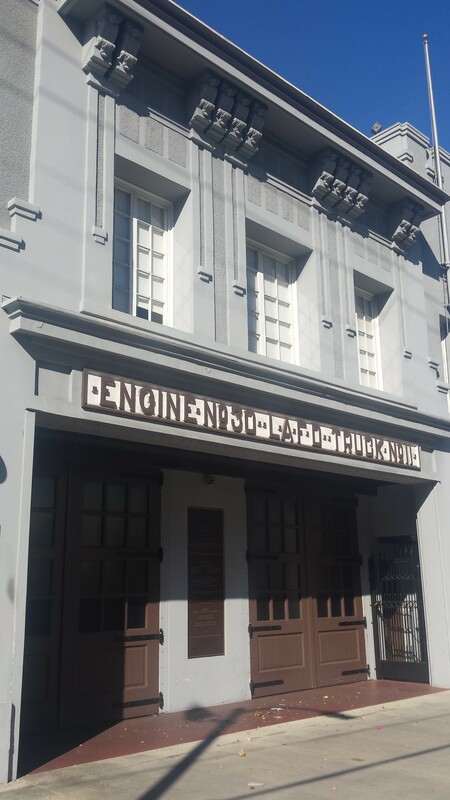 As we entered the building, Jimmy explained that LA’s first fire station housing exclusively African-American firefighters opened in 1913 and operated until 1980. The original floors, ceilings, and poles remain in the building, which is impressive considering that the building was abandoned for fifteen years, housing squatters who, ironically, started a number of fires inside. Photos of the renovation process that started in 1995 and produced the structure standing on Central Avenue today are on display. He went on to introduce to us the late founder of this museum, Arnett Hartsfield, without whom, the museum would not exist. 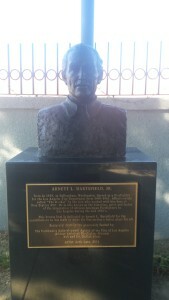 Hartsville worked as a LAFD firefighter from 1940 to 1961. He fought for integration of the fire stations and observed and experienced overt racism on the job, especially after integration was achieved. He chose to document those experiences and eventually succeeded in leaving a legacy in this museum where many of his photographs are on display. Hartsfield served as somewhat of an historian for Black firefighters of LA. He was a larger-than-life figure who, as a firefighter, earned a law degree from USC and was still forced to clean toilets by his White colleagues after the 1954 firehouse integration. 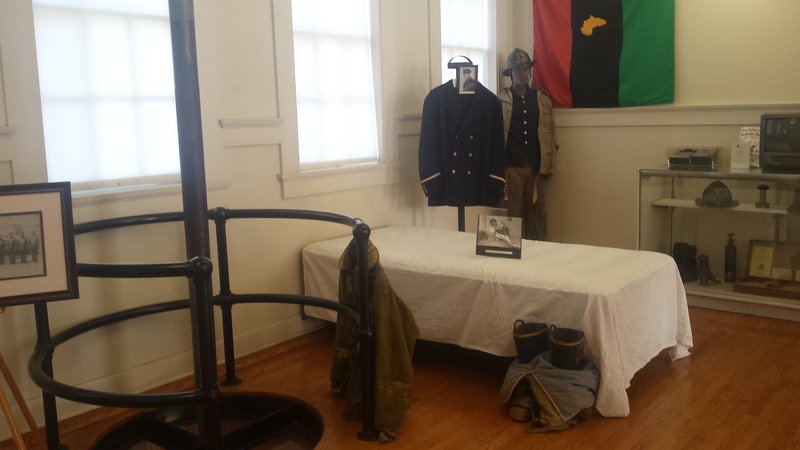 The story of Sam Haskins, the first Black firefighter in Los Angeles, is also told on the first floor of this museum. Haskins was killed in the line of duty in 1895 but did not receive an honorable burial for over 100 years. Jimmy took us up to the upper level of the station which had been the firefighters’ living quarters. Now the rooms are lined with memorabilia, including photographs of former firefighters, firefighting equipment, awards, photos of recent African-American fire chiefs, and one copy each of two editions of the now discontinued “Men of Fire” calendar that, according to Jimmy, more than one woman has tried to swipe from the museum. 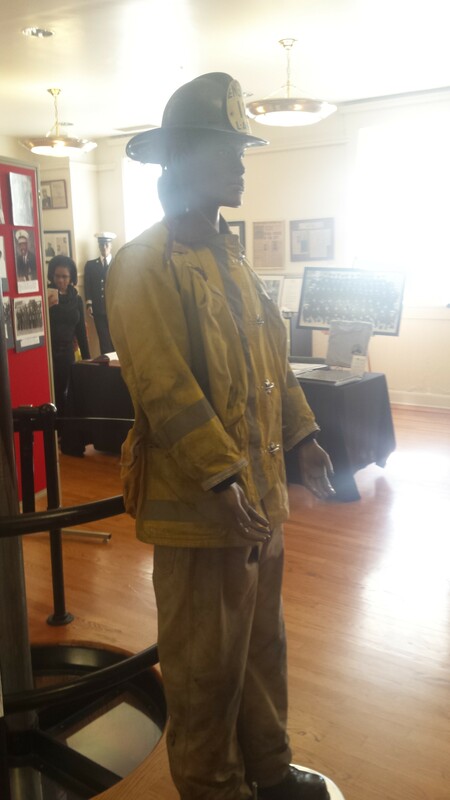 Black female firefighters and firefighters who lost their lives on 9/11 are also honored on this level of the museum. Jimmy even referred to the fragment from one of the fallen World Trade Center towers as the “most important item in the museum,” which gave me a sense of the impact the 9/11 attacks had on all firefighters. Although I met someone from Baltimore’s African American Firefighters Historical Society at the Association for African American Museums Conference in Memphis in August, and I have a Black firefighter in my family, before visiting this museum, I had not given much thought to the history of African-American firefighters in Los Angeles. I am pleased now to recommend the museum to friends and share the small slice of Los Angeles history I learned from my visit.